Something was scaring horses in Vaughan, Montana. On Dec. 26, l975, when the sheriff’s office received a report of horses rearing, pawing the ground and acting frightened, they went to investigate. The two teen-aged girls who’d called the sheriff said they’d seen what spooked the horses. In fact one had even shot at and possibly hit the creature scaring them. In July 1969, on a farm on Lulu Island, near Vancouver, B.C., cows were acting peculiar. The two brothers who owned the farm were puzzled when the cattle suddenly stampeded up to the buildings. These weren’t mild-mannered milkers running for shelter to familiar barns and stanchions. They were tough, cynical range cows, brought to the farm for finishing. Yet, day after day, they ran towards the barns, obviously terrified. The mystery was solved when one brother, out building a fence, saw what was chasing them. In Vaughan, Montana, several people saw the animal scaring the horses. On Lulu Island, an artist drew a picture of the creature which chased the cows, as it crossed the road in front of him. That night, about a mile west, a baby-sitter heard horses making a commotion. When she walked to her home next door, she was startled by the same animal which had frightened them, and the cows. And, that’s odd, because, according to scientists, those cows and horses were spooked by something that doesn’t exist. A Sasquatch. The farmer on Lulu Island saw a tall, dark creature, running upright, chasing his cattle. Both girls in Montana saw an animal over seven feet tall and twice as wide as a man. It was about two hundred yards from them. Looking through a telescopic sight on a 22 rifle, one girl described its face, as “dark, not human.” She fired once to frighten it, but that shot had no effect. When she fired again, she seemed to have hit it. The girls, who ran, said they saw other creatures, like the first one, helping it into the woods. Both girls passed lie-detector tests. Certainly the sheriff’s department believed them. Eye witnesses on Lulu Island also stood by their stories. If the frightened horses and cows could talk, they’d have confirmed what the humans said. It’s not likely those wily range cattle were influenced by yarns round a campfire. Tales of Sasquatches, Bigfoot, and Yeti, humanoid, but not quite human creatures, have come from every continent except Australia and Antarctica. They’ve been reported in forests, mountains, sea-coasts and river valleys. 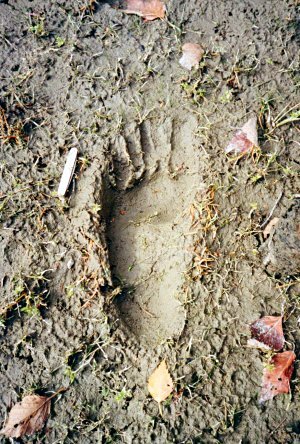 Climber Eric Shipton saw large, bare-foot, human-seeming tracks at 19,000 feet in a Himalayan pass. Almost all First Nations have stories of Sasquatches, not mythical beings, but just as real as deer or coyotes. Mostly scientists dismiss such cultural histories as ‘folklore’, just as they discount Sherpa anecdotes about Yeti, to the indignation of the Sherpa, who point out that they don’t invent any other animals. In North America, there have been reports of Sasquatches from Florida to the Yukon. One of the earliest ‘Sasquatch stories’ is found in Theodore Roosevelt’s “Wilderness Hunter” published in 1892. Roosevelt recounts a story told by and old mountain hunter. “Frontiersmen, “ he wrote, “are not, as a rule, apt to be very superstitious. They lead lives too hard and practical and have too little imagination in things spiritual and supernatural.” The story, of an attack on two trappers in the Bitterroot Mountains of Idaho-Montana, is from a location where Bigfoot sightings are still common. Who sees these creatures or their footprints? Although they have been reported around settled areas, mostly it’s people in the outdoors who spot them: prospectors, loggers, fishermen, highway construction workers, miners, hikers, ranchers. Or, people who work at night such as bus drivers, law enforcement officers, or military personnel. Many observers are experienced hunters or big game guides. The common theory that what they saw was just a bear or its prints doesn’t register well with people who’ve hunted for years and know they’ve never encountered anything like this before. Often people don’t even report what they see. One person who saw –something- is Karen McLaren. Karen is a naturalist, and trained scientist, with life-long experience, hiking, skiing, camping and doing field research in the outdoors. She has made a study of animal tracks in both winter and summer. That’s why the tracks she spotted along the Harrison River, in B.C., in October 1999, caught her attention. She’d been attending a conference at Harrison Hot Springs. During lunch break she and two friends walked from the conference out to the river. The weather had been mixed, mostly drizzly and cool. “It wasn’t the time of year when people would be walking barefoot, in damp ground along the river!” Karen says. One of Karen’s companions didn’t think the tracks unusual. The other, a teacher with years of outdoor travel, thought they were remarkable. By borrowing a camera, Karen managed to get a picture of one footprint. It measured 36 cm.. (l4.17 in), long. They found out later that the tracks were at ‘Sasquatch Rock’, an aptly named landmark. “Nobody would believe that coincidence!” laughs Karen. What is it? Some people speculate that Sasquatches are a species of giant ape, gigantopithecus, perhaps, which has managed to survive. Russian scientists, who take the creatures seriously, theorize that they may be the last remnants of Neanderthal populations. Maybe stories of giants and ogres aren’t fairy tales but cultural memories of large creatures which once lived alongside humans. In general, scientists scoff an ‘anecdotal evidence’ , eyewitness accounts which would probably be accepted in a court of law. However, not until 1902, when the first mountain gorilla was captured, did scientists believe it was anything but the imagination of native Africans. The Komodo dragon, another native ‘myth’, was first seen by Western scientists in 1912. Giant pandas, now so familiar and popular, weren’t captured until 1937. In every case, the locals were right. Even though a 1950’s British team searching the Himalayas for the Abominable Snowman, didn’t find the Snowman, it did turn up four other previously unknown animals. There’s still a lot to discover. Meanwhile, I put my trust in Karen. And those wary range cows.